I may not be very smart, but I have not had a losing year in the stock market in 18 years. Probably not a good way to start off a column telling you how dumb I am, but I know there are many folks out there who know a lot more about the market than I do. Everyone who trades, (sorry, I should call it investing like those smart brokers do, but the real name is gambling) wants to make money. And never listen to an economist. My first broker gave me lots of action. Buying and selling. Real name is burning and churning. Then I saw charts on his desk and realized this was a better way than all that nonsense information about P/Es, cash flows, management experience, etc, etc. Of course, like every other newbie I grabbed hold of the tiger’s tail and was quickly eaten. Broke, that is. Telling the truth I went broke twice before I learned my trade. You don’t have to. There is a very simple method. 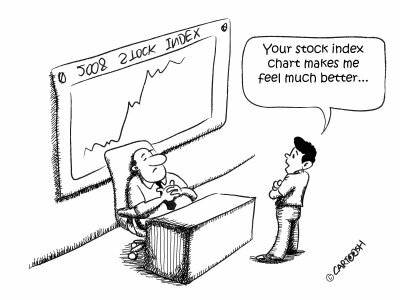 There are literally hundreds of ways to interpret the prices on a stock chart. You only have to know 2 or 3 and your fortune is assured. Really. Chart patterns repeat. They repeat and repeat year in and year out. The charts of the stock market today and those of 100 years ago are exactly the same. I am talking about the patterns that repeat. The reason is brutally simple. Man has not changed. His reasons for buying and selling are two basic emotions – fear and greed. The chart shows them clearly. It is up to the trader, oops investor, to learn them. For the long term investor who wants to save for retirement he only needs to know when the market is going up and when it is going down. As I have shown in previous columns it is not hard to do. I don’t trade individual stocks as I’m not smart enough to find the next IBM, Apple or Google. I stick to bundles of stocks called mutual funds or exchange traded funds, ETFs. These don’t cause me to lose sleep as they are not as volatile. For example the S&P500 Index has an exchange traded fund (ETF) called SPY. Put this up on your computer with a chart showing the last 5 or 10 years. Then put in a 200-day moving average line. When the line turns up, BUY. When the line turns down, SELL. You are now smarter that 99% of the brokers in the world. This simple line plots the fear and greed thinking of everyone who is trading in the market. The smart thing about this is to pull the trigger when that line changes direction. You are now an expert market technician. Al Thomas’ new book, “If It Doesn’t Go Up, Don’t Buy It!”, 3rd edition, has helped thousands of people make money and keep their profits with his simple 2-step method. The method made 10% during 2008. Read the first chapter at http://www.mutualfundmagic.com and discover why he’s the man that Wall Street does not want you to know. Copyright 2010 Williamsburg Investment Co. All rights reserved.